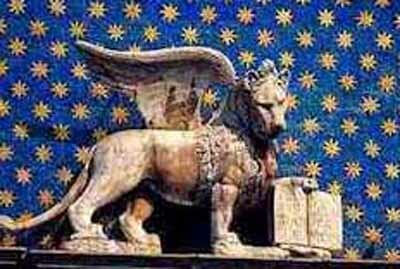 The winged lion is a symbol of peace. with its book closed is a symbol of war. 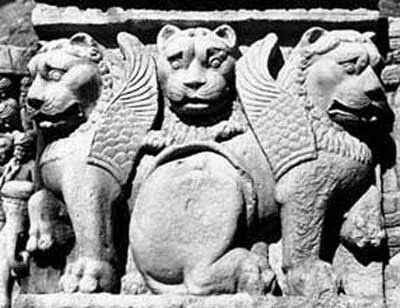 The Gate of Xerxes at Perespolis shows that the Winged Lion was placed at the corner of one entrance. When you stood in front of the gate you saw a lion with four legs and when you were inside the gate you saw a lion with four legs. In art, lamassu were depicted as hybrids, winged bulls or lions with the head of a human male. There are still surviving figures of lamassu in bas-relief and some statues in museums, most notably in the British Museum, MusŽe du Louvre, National Museum of Iraq, Metropolitan Museum of Art and the Oriental Institute, Chicago. They are generally attributed to the ancient Assyrians. The lamassu is at the opening of the city, so that everyone who enters sees it. From the front it appears to be standing and from the side walking. This was intentionally done to make it seem powerful. The lamassu in real life is very tall. In this case the lamassu is being used as a symbol of power. The motif of a winged animal with a human head is common to the near east, first recorded in Ebla, around 3000 BCE. The first distinct lamassu motif appeared in Assyria during the reign of Tilgath Pilser. 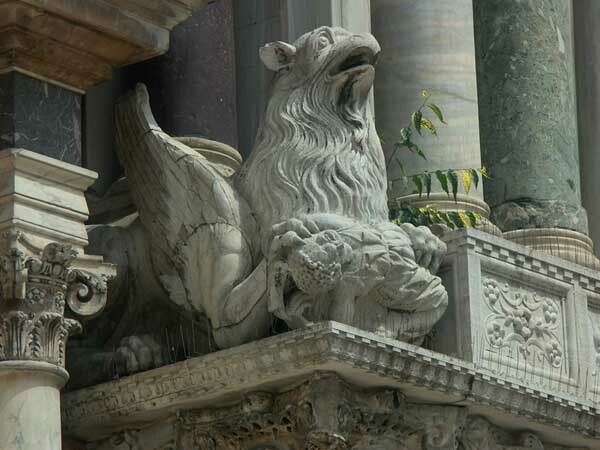 In a much later period, a winged lion appeared on the flag of the Republic of Venice; however, this refers to Saint Mark the Evangelist, the patron saint of Venice. A winged bull with the head of a bearded man appears on the logo of United States Forces - Iraq in reference to Iraq's ancient past. The lamassu is a celestial being from Mesopotamian mythology. Human above the waist and a bull below the waist, it also has the horns and the ears of a bull. It appears frequently in Mesopotamian art, sometimes with wings. 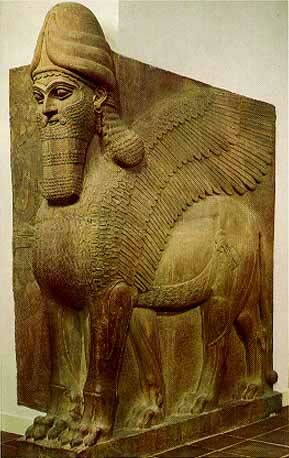 The lamassu and shedu were household protective spirits of the common Babylonian people. 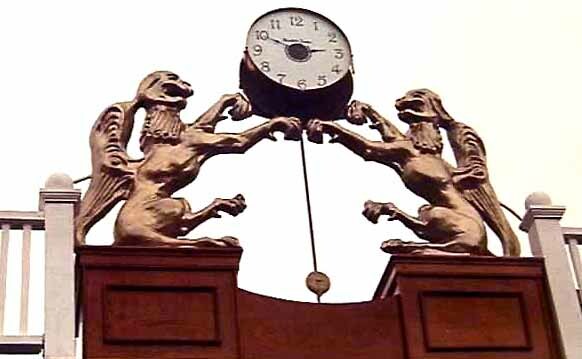 Later during the Babylonian period they became the protectors of kings as well always placed at the entrance. Statues of the bull-man were often used as gatekeepers. The Akkadians associated the god Papsukkal with lamassu and the god Isum with shedu. 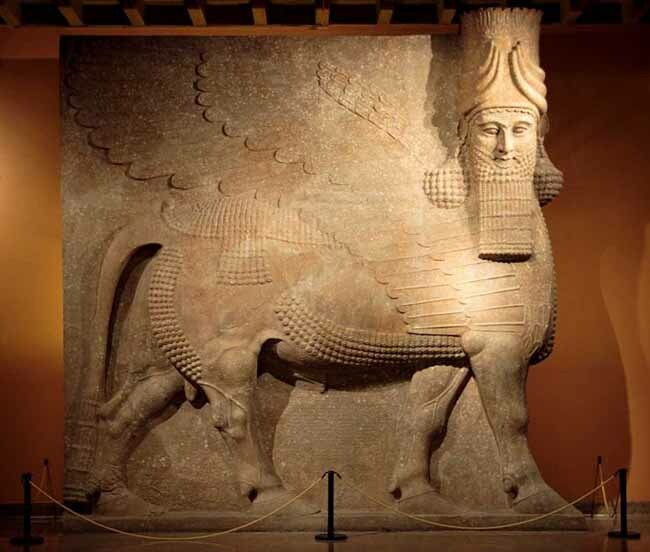 To protect houses, the lamassu were engraved in clay tablets, which were then buried under the door's threshold.They were often placed as a pair at the entrance of palaces. At the entrance of cities, they were sculpted in colossal size, and placed as a pair, one at each side of the door of the city, that generally had doors in the surrounding wall, each one looking towards one of the cardinal points.